Well HellOOOOOOO November! I don't know if I've ever been so happy to see a month! Good riddance, October. 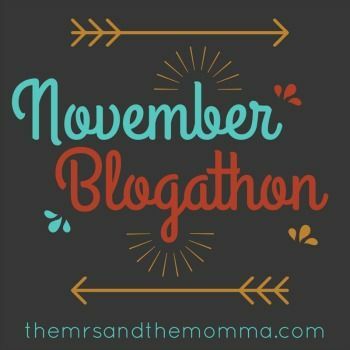 Not only am I psyched about the holidays, cooler weather, and everything else that accompanies November...but YAY for the first day of the November Blogathon! Today's prompt is write 30 things about yourself, as we are kicking off a month that has 30 days. If you're blogging along this month, make sure to use the hashtag #NovemberBlogathon and support our fellow participating bloggers! If you need a refresher on any of the prompts, see my original post HERE. 1. I abhor Texas summers. Like...they disgust me. Non-stop sweating is something this world could do without. 2. My favorite candy used to be Hot Tamales but has now evolved into a more sophisticated sour gummi worms. 3. List making is my love language. 4. I got my middle finger slammed in the hood of our suburban when I was in high school and it's been crooked ever since. 5. When my mother and I shop together, it's a dangerous combo. 6. I am weirdly familiar with 90's NBA and NFL players. So strange. 7. There are only two foods I don't like...mayo and cheesecake. 8. Most of my childhood, I was on a competitive jump roping team. I can still do most of the tricks...although, after having kids, I usually have to go change my undergarments following the jumping. 9. Friends, and sometimes strangers, often feel the need to divulge very intimate things about them to me...I guess I'm a good listener or seem trustworthy. 10. I'm the deepest sleeper you'll ever meet. 11. Blake and I had always wanted to have 4 kids by the time we were 30...we were blessed to accomplish that goal with one month to spare. :) 12. I have two bachelors degrees...one in Finance and one in Marketing. 14. Ready for a shocker??? I'm not a natural platinum blonde. 15. I'm a born and bred Texan and proud of it! 16. In most areas of my life I have a "good enough" attitude, except with my photography. I'm extremely critical and constantly look back and fret about things I could have done better. 17. My parents were both public educators, which makes it somewhat ironic that I homeschool Tyler Bree. 18. I don't like being told what to do...which sometimes manifest itself as a problem with authority. Makes me want to dig in my heels even more. 19. My first two deliveries were vaginal, followed by a c-section and a VBAC. You're life is richer now that you know that information, isn't it? ;) 20. I hate cats. 21. I LOVE working with the youth in our church. They have such sweet souls. 22. On my travel bucket list, I want to visit Scotland, England, and Hawaii...in that order. 23. I'm a compulsive changer of hair styles/color. BUT, I've stuck with my current platinum pixie for almost a year and I actually don't feel the itch....yet. 24. For half of the year, my kids' ages are every other year, for example, in December they'll be 3, 5, 7, 9. 25. My husband is really something else. All that I'm able to accomplish or do is all because of him. I'm so grateful for a husband who puts me above his needs...and I strive to do the same. 26. My biggest weakness is my lack of patience. 27. One of my direct ancestors, a great-great-great-etc. grandfather was William Penn. 28. My favorite part of any movie is the end of "Cars". It brings tears to my eyes every single time. 29. On that last note, I'm weirdly unemotional when it comes to big events in my life when normal people cry. I was dry-eyed at my wedding, birth of my babies, and etc. What is wrong with me? 30. 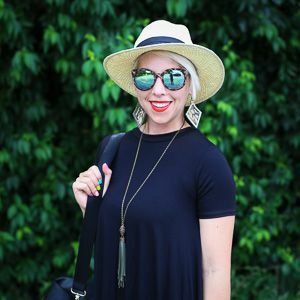 And finally, I really love making connections with blogging. I've met some really great people and want to meet more...but I'm awful at reaching out. So drop and email, tweet me, or whatever...I want to be your friend! I'm a native Texan too who can completely comiserate with you on the hatred of the summers! When I was elementary school, we saw a group of competitive jumpropers called the "Skip Its" and I wanted so badly to be one that I practiced all day and night after seeing them and then I couldn't walk the next day. I had over-exerted my muscles so badly that I couldn't walk! LOL I homeschooled my oldest two years and LOVED IT! :) I *totally* love your hair but I do NOT have the kahonas to do that! Why? I have absolutely NO idea. I love the idea of being a change artist but the maintenance and me -- yeah, they don't go so well together! Thanks for hosting! :) Glad to be along for the ride! Are you going to have a link up where I can link to each of the topics? I had no idea about the births of your kids. I'd love to hear those stories individually! And I so want to visit Scotland as well. We should plan a trip one of these days :) ! Just published mine!! I think you should add a link widget too!